Follow these simple steps to quickly put Tertill to work weeding your garden. Step 1: Unpack Tertill, the plant collars, wrench, and spare whackers from the shipping box. Step 4: Place Tertill on the ground in the garden. Press and release the power button to turn it on, wait a few seconds for start-up, then press and release the button again. After playing a tune, Tertill will begin to patrol for weeds. Step 5: Now you are free to do the gardening tasks you enjoy. When it has charged enough from the sun, Tertill will patrol automatically. It is designed to stay out in your garden rain or shine. Step 6: If you need to stop Tertill while it is operating, pick it up by the rear handle (under the power button), and turn it over. The wheels will stop turning. To turn off the robot, press and hold the power button for 10 seconds. 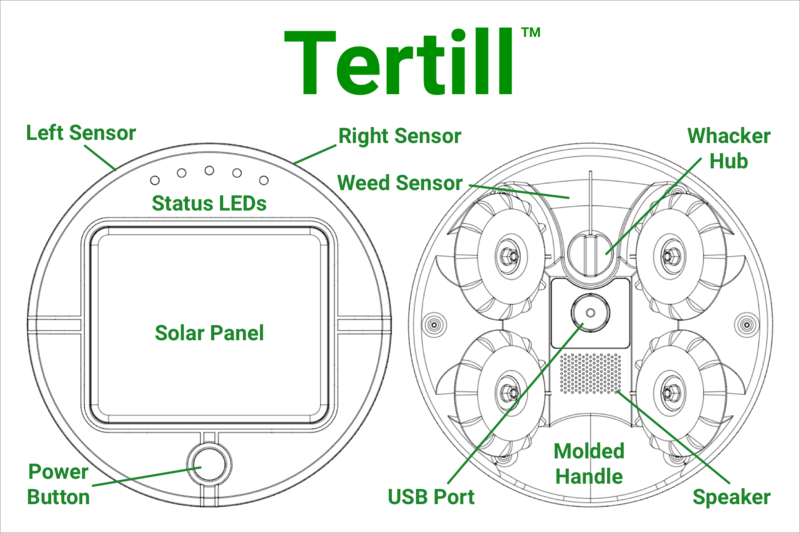 The Owner's Manual provides more details about Tertill .